Is the game-used uniform swatch in your sports memorabilia trading card real? Recent court cases put the authenticity of these swatches in doubt. Yet another in a series of stunning legal cases related to fraud within the sports collectibles market made mainstream news outlets across the country last week. A sports memorabilia dealer was sentenced for selling off-the-rack replica jerseys to sports card companies that he claimed were actually game-worn jerseys. 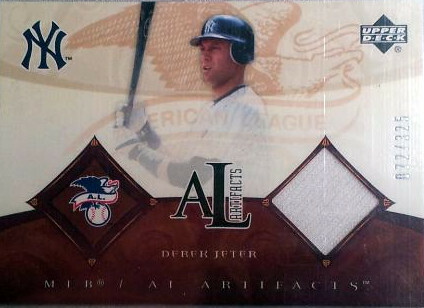 These jerseys were then allegedly cut up and embedded in sports collectible cards. Now, sports card collectors who are left wondering which cards contain real jersey swatches and which ones are fake. The latest revelation comes as the culmination of several-year investigation. In 2009, Brad Wells, one of the owners of the Florida-based companies Authentic Sports, Inc., and Historic Auctions admitted to investigators that he had acquired off-the-rack, replica jerseys, doctored them to make them appear game-used and then sold them to collectors, other dealers and, most importantly, trading card companies. According to memorandums filed by Wells’ defense attorney, Wells told investigators that buyers from Donruss/Playoff, Upper Deck and Topps knew they were purchasing phony jerseys and either knew or should have known that they were passing along fake jersey swatches to collectors. But other than the word of Wells, who was convicted of fraud and sentenced to six-months in prison, it appeared that no other evidence existed to support the claim that the trading card companies were in anyway complicit in the alleged wrong-doing. The Panini America Company, which purchased Donruss/Playoff in 2009, including the entire company’s “game-used” inventory, is claiming that as a result of Mr. Wells crimes, it lost $2.7 million in future sales, having spent $125,000 acquiring alleged game-used jerseys as part of the acquisition of Donruss/Playoff. This issue came to light when the company submitted at least one Victim Impact Statement as part of its request for restitution. To date, both of the other major trading card companies operating at that time (2004-09) has, as of yet, hasn’t filed any similar documents. However, the story doesn’t end with Brad Wells. His cooperation with the government—which led to a reduced sentence—helped procure the arrest of similar sports memorabilia dealers. 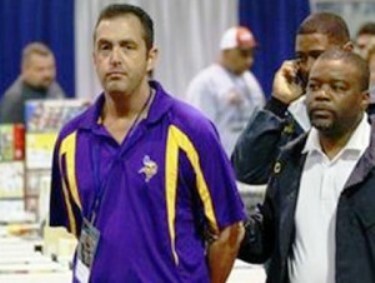 At the National Sports Collectors Convention in Rosemont, Ill., in 2011, Steve Jensen, owner of Minnesota-based Vintage Authentics, was led off the convention floor in handcuffs, escorted by police. Accused and eventually convicted of selling bogus player-worn and game-used jerseys to unsuspecting collectors, Jensen was sentenced last week to three years of probation and four months of electronically monitored house arrest. His cooperation is said to have led to the indictment of three additional dealers—Brad Horne, Jarrod Oldridge and Bernard Gernay—who all pled guilty to similar crimes and will be sentenced at the end of this month. Interesting to note is that at least one of these men, Gernay, was on Major League Baseball’s approved vendor list. As related to the impact on trading card collectors, Oldridge’s defense memorandum seemed to lend at least some bit of credibility to the earlier statements made by Wells, as they related to the trading card manufactures’ complacency at the least and complicity at the worst. Meanwhile, Panini America is claiming an additional $7.7 million in damages as a result of having obtained $328,000 of unusable inventory, which is known to have come directly from Oldridge. While the sports collectibles world awaits the sentencing of the additional individuals cited in this article, collectors are left with virtually no recourse of compensation or knowledge of whether the memorabilia cards they have in their collection from those years are real or not. In talking to a former product development manager from one of the aforementioned trading card companies, he said that it would be impossible to determine which jersey swatches went into what products. After the jersey is inventoried and receives a serial number, the jersey is cut into hundreds of pieces. These pieces are then put into a bag which may or may not at the time contain other pieces of existing game-used jersey swatches of that particular player mixed in. We’ll provide updates to this story as additional details become available. Rob Bertrand has been an active collector of sports cards and memorabilia for more than 20 years. His involvement in the hobby community is well documented, having been the content manager for the Card Corner Club website before the company’s merger with CardboardConnection in 2011, where he is now a staff writer and multimedia content producer. Rob is also the co-host of the sports collectibles hobby’s only live and nationally broadcast radio show, Cardboard Connection Radio. He is the author of the highly respected and trafficked blog, Voice of the Collector and you can follow him on Twitter @VOTC. A dealer himself, Rob runs an online business through eBay, and is frequently asked to consign collections.